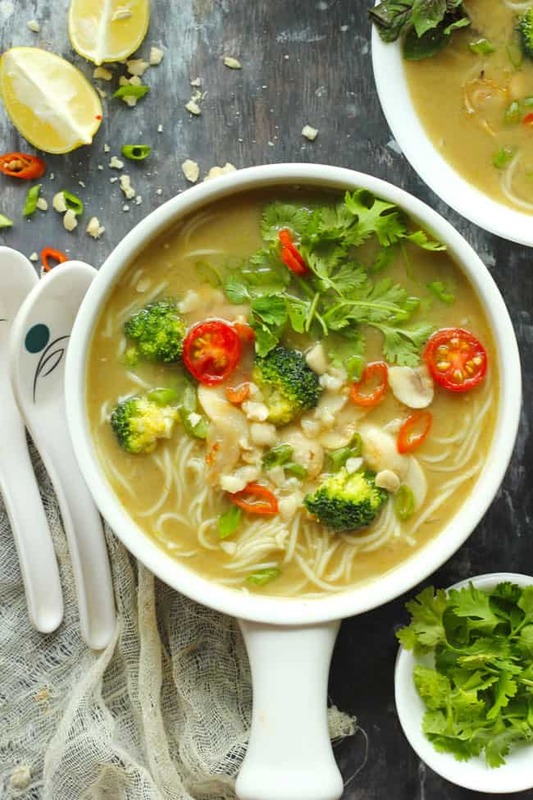 This Thai Green Curry Soup is a healthy, hearty, bowl of comfort soup. And it is surely going to keep us warm during the cold winter nights. I am always looking for soup recipes that are more like a one-bowl meal. 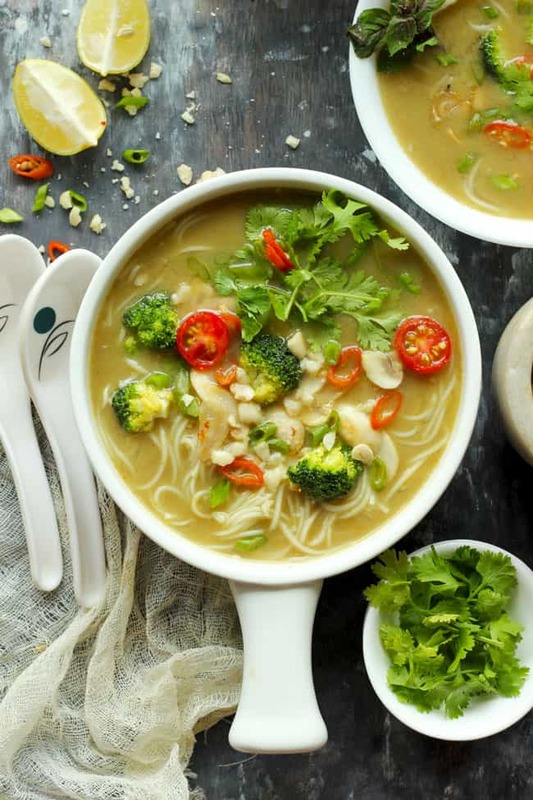 This Thai green curry soup rainchecks all the criteria of a perfect one-pot meal. It is literally prepared in a one-pot, loaded with all the good things and is really healthy too. The good news is it is 100% gluten free and vegan too. 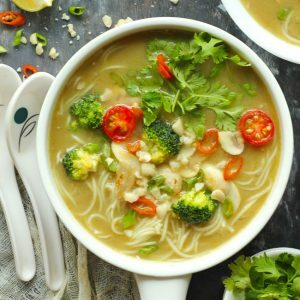 I think I have given you more than one reason to bookmark this vegan thai green curry soup recipe. 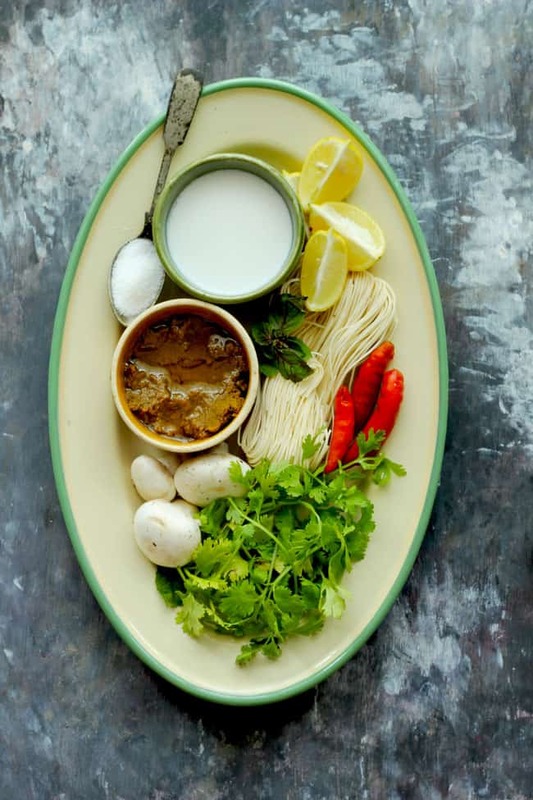 Favorite Soups This Season – Healthy Mushroom Soup, Mulligatawny Soup, and Cream of Garlic Soup. How did this amazing soup happen? While on a fridge cleaning mission I landed upon leftover Thai Green Curry Paste and few vegetables. With these two in hand, it was not difficult to plan this delicious green curry soup. And once I ended up making it I realized it happen to be vegetarian, gluten-free and vegan, how fabulous! But I am sure it will taste equally tasty with the addition of prawns or chicken. Though I have made this soup to soothe my soar senses from the cold autumn breeze you can make it throughout the year. It is that one kind of soup that will comfort the soul during any time of the year. And it won’t be a wonder if it makes it to the list of your favorite weeknight dinners. The best part about the Thai Green Curry Soup Recipe is you can tweak it as per your liking. Like, use your favorite seafood instead of veggies, or replace vermicelli noodles with your pick of pasta. And also, you can use homemade green curry paste for the recipe. For me, the store bought green curry paste yield perfect flavor and taste in this soup. The packaged curry paste helps make this soup real quick and saves me lot of time too. 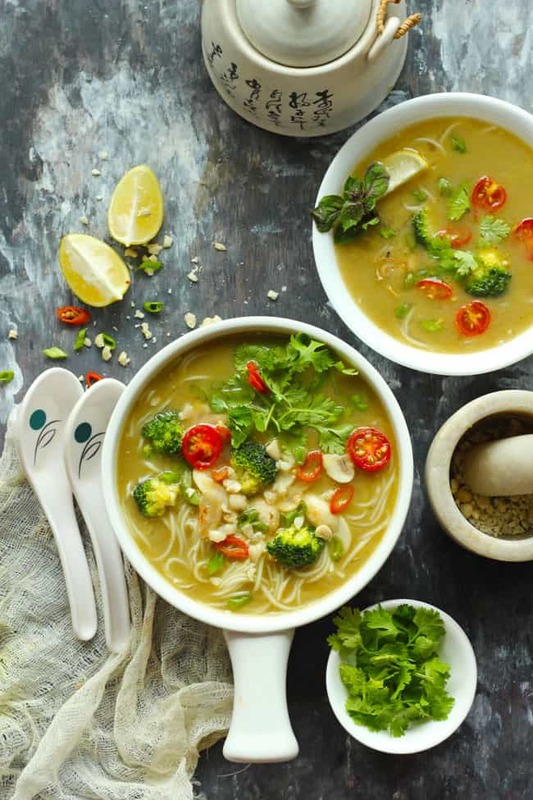 This Thai Green Curry Soup is a healthy, hearty, bowl of comfort soup. Heat oil in a saucepan. Add the vegetables (broccoli, mushroom) and saute till they turn soft. Transfer to a plate and set aside. In the same saucepan, add the green curry paste. Saute the curry paste for a minute. Add the coconut milk, brown sugar and soy sauce. Stir until the curry paste is nicely dissolved. Now add the vegetable stock, salt, red chillies and stir to combine. Bring the soup to a boil over high heat. Reduce the heat and allow the soup to simmer for 5 minutes. Add the vermicelli noodles and the vegetables. Simmer till the noodles are cooked. Turn off the heat and give soup a nice stir. Taste and adjust the seasoning and consistency accordingly. If too thick add more stock or coconut milk. Just before serving garnish soup with fresh herbs, crushed peanuts and juice of lemon. Serve Thai Green Curry Soup warm. This looks amazing! I’ll be trying it with courgetti for a low carb version.